Rosenhagen, Hans (1908). 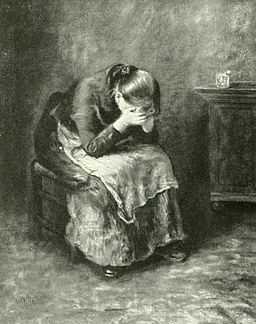 “Uhde: des Meisters Gemälde” (“A Weeping Girl”) courtesy wikimedia commons. Three years ago, when we started the McDaniel Romance Writing program, Jenny told us a story about how, at some conferences, she would hole up in a hotel room with her friends, one of them crying about what a hack writer she was, the other two consoling the weepy one over a bottle (or few) of wine. Friday was one of those nights for me — minus the friends and wine. Not because my friends, the fellow Eight Ladies, wouldn’t have been there if I wanted them, but I was sick, and didn’t want them to catch what I had. I’m not even sure how I ended up in a weepy puddle while on the phone with my husband. I’ve had an incredible streak of good fortune lately with my book. I’ve finaled in a few contests, I’ve figured out how to prop up my saggy middle, and I’ve gotten some amazing feedback. I had two pitches earlier that day. I admit I wasn’t in my best form (I would rather have been in the bathroom), but I received requests (even if they seemed like “sympathy” requests). And yet I cried my little heart out. But I’m okay with that. I think sometimes we need to have a down time…a time of self-doubt. Of introspection. Of self-awareness. (And if crying is involved…welll, that’s okay, too.) We need this so we remain determined and committed to work. In the weeks to come, I’ll share some of the amazing things I learned at RWA Nationals. But right now, I’m still thinking about what I have to do. About how much work I have ahead of me, and how hard I will have to work to achieve my goals. What do you do when you feel down about writing? This entry was posted in Everything Else, Persistence and tagged #amwriting, bad writing days, eight ladies writing, Elizabeth Eldridge, fiction writing, Justine Covington, motivation, newbie writer, romance writing, RWA15, writing goals, writing misery, writing motivation, writing process, writing tips, writing tricks. Bookmark the permalink. ← Nancy: RWA 2015 – A Success for the Eight Ladies Writing! I wallow and feel sorry for myself until I get bored. Then I get back to work. Yeah, today is my last day of wallowing. I fly back to AZ and will get back to work. But it was quite cathartic to have it out with the tears. I wallow in self-doubt and then go swim. If it’s any consolation, I had a good minute and a half cry on Sunday morning. Not because of where I am with my writing or because the conference didn’t go well for me (it did) or because my expectations this year weren’t met (they were), I cried because it was over, and much too soon, and because an issue I’ve had under control for almost a year resurfaced and robbed me of one last chat with the ladies. I’m thinking of taking up yoga, in part because I’m stiff as a board, but also for head-clearing time. I can’t do Tae kwon do anymore because of my shoulder, so maybe sweating it out and stretching will help. You won’t believe this…but when I got up this morning, I was thinking about looking into yoga or meditation classes for the same reason you describe. I have found yoga to be really helpful for head-clearing / focusing (not to mention the stretching and strengthening). I started a few months ago and love it. My class is done in the semi-dark and the instructor has a very soothing voice. It’s good to have a cry and get it all out – helps you to reset yourself and move on. Also, I think there’s something quite emotional about Nationals – being surrounded by so many like-minded people and almost being able to touch the career you want, but still not quite being there (getting closer all of you). I felt some of that just (sadly) watching Twitter hashtag! Btw, I’m starting guerrilla warfare campaign to try to get to San Diego next year – wish me luck! You go, girl! Hope to see you there. Good luck, Rachel! San Diego will be a big investment, but it has to be done – as a fellow Brit I can confirm RWA National is totally worth it. In fact, I spent a couple of hours yesterday checking out my 2016 travel options 😉 . I think you hit the nail on the head there, Rachel. Sooooo close! I think it helped to be writing. I haven’t gone back and looked at what I wrote. No doubt it was a load of @#$%!. But I think it is important to keep writing when you feel like this. What a good idea to write everything down! My husband is a licensed therapist, so talking to him is like talking to a shrink. But if I didn’t have him around, I think journaling is a wonderful way to go. In fact, I should consider doing it, even if it’s just to get frustrations/disappointments off my back. I’m glad I’m not the only one who had a dismal pitching session, too. Why can’t everyone be as excited about our books as we are?!? I think the good cry doesn’t get the respect it deserves. I always feel bloated and puffy and headachy the next day, but then after that, I feel so much better (usually by noon). All that stress needs an escape valve. Crying is better than a lot of things we could be doing to ourselves . . . . Crying as an escape valve is a perfect metaphor, Micki. It was a bunch of stuff all piled up for me (including illness, a sick kid, and sleep deprivation), and it needed a release.